Groups: used to manage UNIX-style groups on the FreeNAS® system. 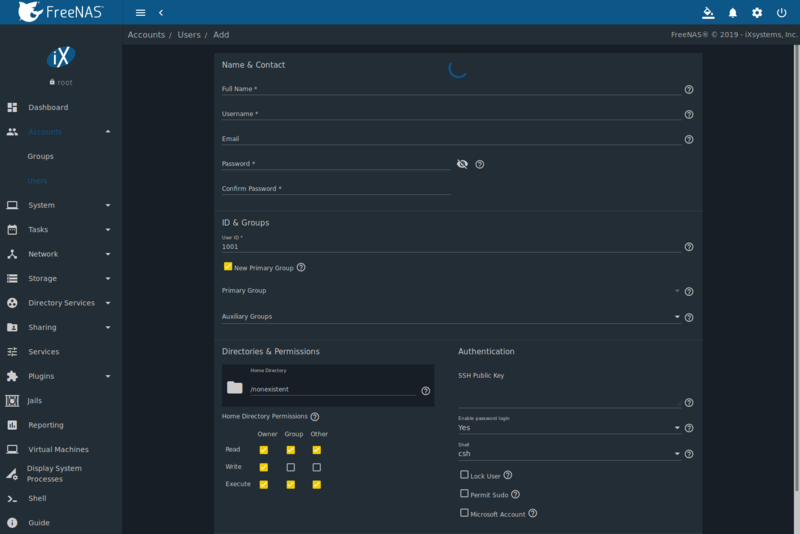 Users: used to manage UNIX-style accounts on the FreeNAS® system. Each entry is described in more detail in this section. 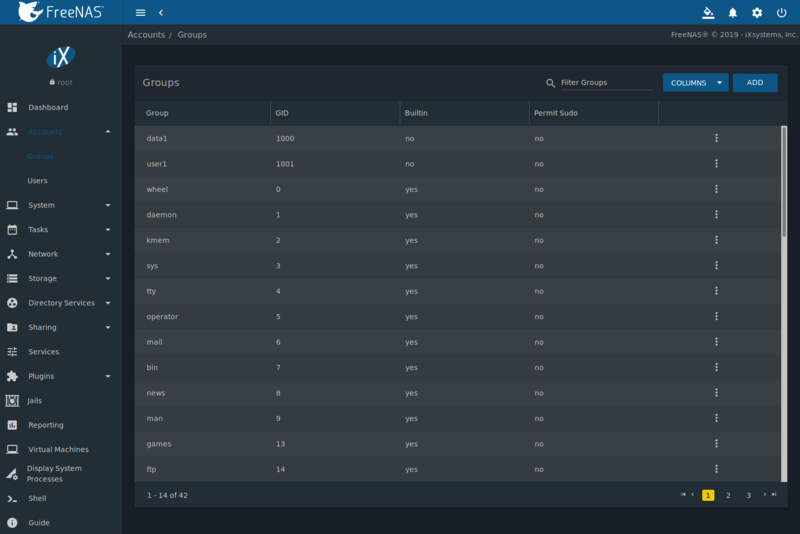 The Groups interface provides management of UNIX-style groups on the FreeNAS® system. It is unnecessary to recreate the network users or groups when a directory service is running on the same network. Instead, import the existing account information into FreeNAS®. Refer to Directory Services for details. This section describes how to create a group and assign user accounts to it. The next section, Users, describes creating user accounts. Click Accounts ‣ Groups to see a screen like Figure 5.1.1. The Groups page lists all groups, including those built in and used by the operating system. The table displays group names, group IDs (GID), built-in groups, and whether sudo is permitted. Clicking the  (Options) icon on a user-created group entry displays Members, Edit, and Delete options. Click Members to view and modify the group membership. Built-in groups are required by the FreeNAS® system, so they do not have Edit or Delete buttons. The ADD button opens the screen shown in Figure 5.1.2. Table 5.1.1 summarizes the available options when creating a group. GID string The next available group ID is suggested. By convention, UNIX groups containing user accounts have an ID greater than 1000 and groups required by a service have an ID equal to the default port number used by the service. Example: the sshd group has an ID of 22. Name string Enter an alphanumeric name for the new group. The period (. ), hyphen (-), and underscore (_) characters are allowed as long as the group name does not begin with a period (.) or hyphen (-). Permit Sudo checkbox Set to allow group members to use sudo. When using sudo, a user is prompted for their own password. Allow repeated GIDs checkbox Set to allow multiple groups to share the same group id (GID). This is useful when a GID is already associated with the UNIX permissions for existing data. 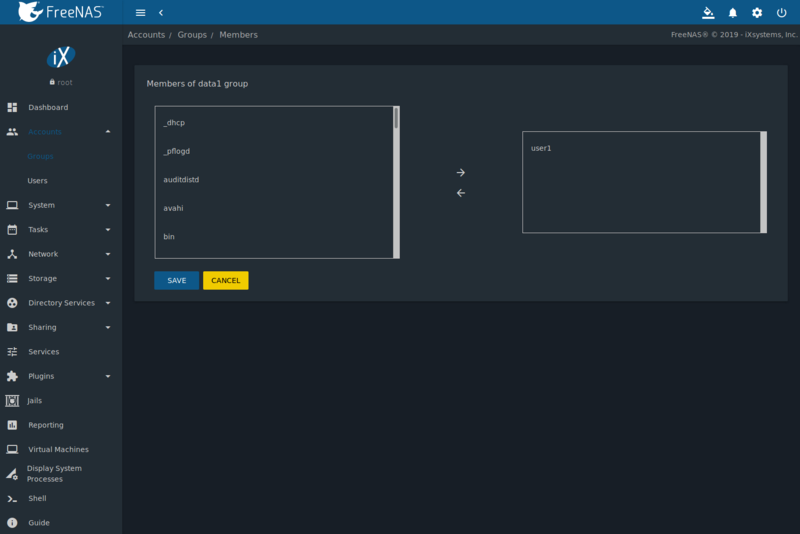 After a group and users are created, users can be added to a group. Click  (Options) on the desired group then Members. Select the users in the Members list. This list shows all user accounts on the system. Next, click -> to move the users to the right frame. Press SAVE to add the users on the right frame to the group. Figure 5.1.3, shows user1 added as a member of group data1. The Delete button deletes a group. The pop-up message asks if all users with this primary group should also be deleted, and to confirm the action. Note built-in groups do not have a Delete button. Create a guest account for all users, or create a user account for every user in the network where the name of each account is the same as a login name used on a computer. For example, if a Windows system has a login name of bobsmith, create a user account with the name bobsmith on FreeNAS®. A common strategy is to create groups with different sets of permissions on shares, then assign users to those groups. If the network uses a directory service, import the existing account information using the instructions in Directory Services. 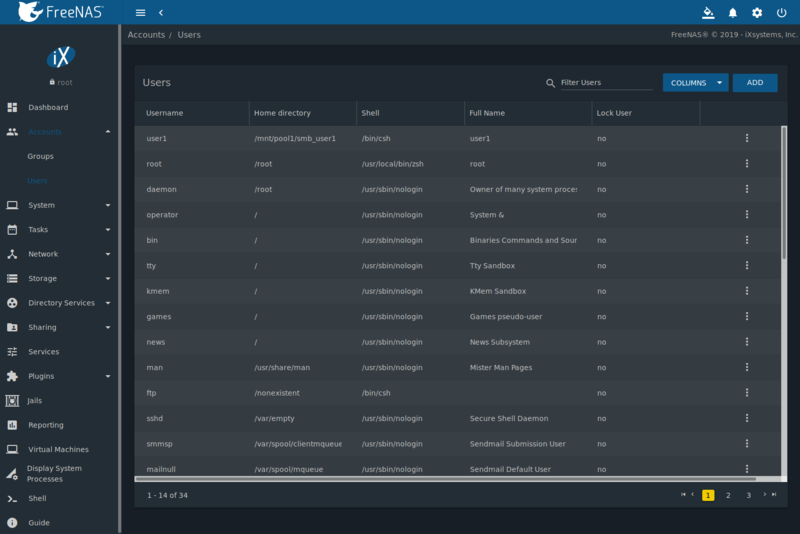 Accounts ‣ Users lists all system accounts installed with the FreeNAS® operating system, as shown in Figure 5.2.1. By default, each user entry displays the username, home directory, default shell, the user full name, and if the user is locked. This table is adjustable by setting the different column checkboxes above it. Set Toggle to display all options in the table. Clicking a column name sorts the list by that value. An arrow indicates which column controls the view sort order. Click the arrow to reverse the sort order. Click  (Options) on the user created account to display the Edit and Delete buttons. Note built-in users do not have a Delete button. Setting the email address for the built-in root user account is recommended as important system messages are sent to the root user. For security reasons, password logins are disabled for the root account and changing this setting is highly discouraged. Except for the root user, the accounts that come with FreeNAS® are system accounts. Each system account is used by a service and should not be used as a login account. For this reason, the default shell on system accounts is nologin(8). For security reasons and to prevent breakage of system services, modifying the system accounts is discouraged. The ADD button opens the screen shown in Figure 5.2.2. Table 5.2.1 summarizes the options that are available when user accounts are created or modified. When using Active Directory, Windows user passwords must be set from within Windows. Full Name string This field is mandatory and may contain spaces. Email string The email address associated with the account. Password string Mandatory unless Enable password login is No. Cannot contain a ?. Click  (Show) to view or obscure the password characters. Confirm Password string Required to match the value of Password. User ID integer Grayed out if the user already exists. When creating an account, the next numeric ID is suggested. By convention, user accounts have an ID greater than 1000 and system accounts have an ID equal to the default port number used by the service. New Primary Group checkbox Set by default to create a new a primary group with the same name as the user. Unset to select a different primary group name. Primary Group drop-down menu Unset New Primary Group to access this menu. For security reasons, FreeBSD will not give a user su permissions if wheel is their primary group. To give a user su access, add them to the wheel group in Auxiliary groups. Auxiliary groups drop-down menu Select which groups the user will be added to. Home Directory browse button Browse to the name of an existing pool or dataset where the user will be assigned permission to access. Home Directory Permissions checkboxes Sets default Unix permissions of user’s home directory. This is read-only for built-in users. SSH Public Key string Paste the user’s public SSH key to be used for key-based authentication. Do not paste the private key! Enable password login checkbox Set to disable password logins and authentication to SMB shares. To undo this setting, set a password for the user with the Edit button for the user in Users. Setting this option grays out Lock user and Permit Sudo, which are mutually exclusive. Shell drop-down menu Select the shell to use for local and SSH logins. See Table 5.2.2 for an overview of available shells. Lock User checkbox Set to prevent the user from logging in until the account is unlocked. Setting this option grays out Disable password login, which is mutually exclusive. Permit Sudo checkbox Set to allow members of the group to use sudo. When using sudo, a user is prompted for their own password. Microsoft Account checkbox Set if the user is connecting from a Windows 8 or higher system. Some fields cannot be changed for built-in users and are grayed out. scponly Select scponly to restrict the user’s SSH usage to only the scp and sftp commands. 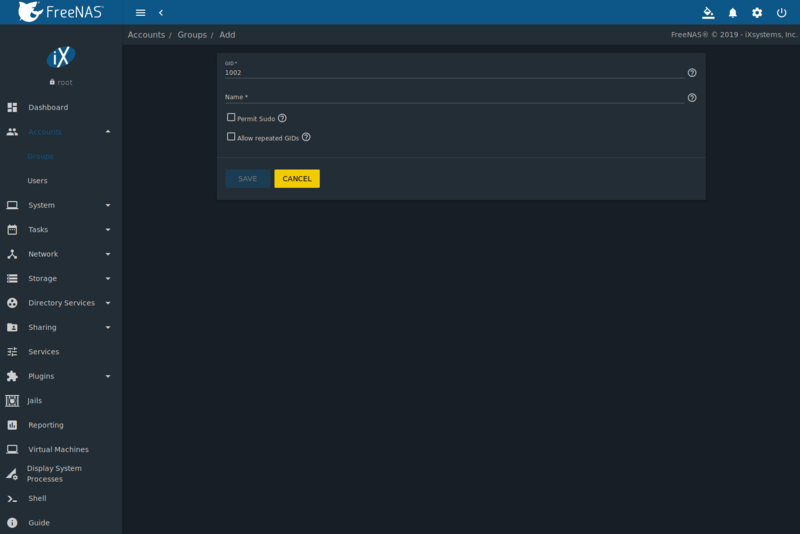 nologin Use when creating a system account or to create a user account that can authenticate with shares but which cannot login to the FreeNAS system using ssh. Built-in user accounts needed by the system cannot be removed. A Delete button appears for custom users that were added by the system administrator. Clicking Delete opens a popup window to confirm the action and offer an option to keep the user primary group when the user is deleted.